Grace is studying at Anglia Ruskin University in Cambridge and also teaches Zumba Dance. Here's some selected photographs from her first Portfolio Builder day at the weekend, where we experimented with hats, 'Gypsy' style outfits and amazing face painting. This was a really fun day as Grace took direction very easily, and also used her own creativity and input on the shots. Her dark hair, olive skin and natural beauty made her a joy with which to work. Really looking forward to working with her again on new ideas we’ve already thought about. 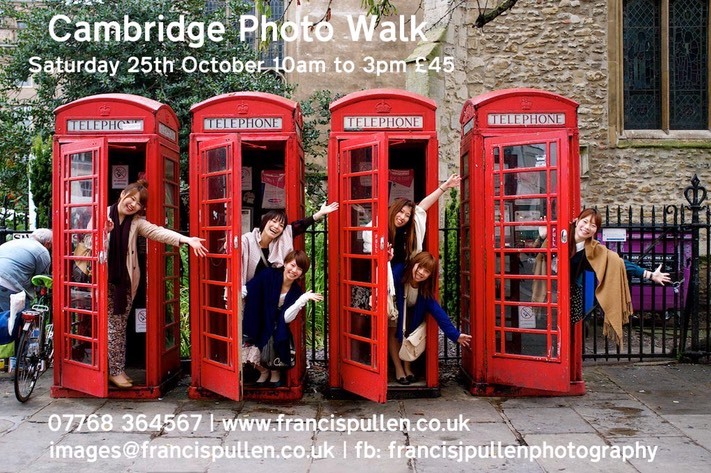 The next Cambridge Photo Walk is on Saturday 25th October - Limited spaces, so Contact me now. Cambridge has a wonderful diversity of residents, tourists from all around the world and of course the transient student population. They all mingle and interact with each other, with the street performers, and sit on walls and benches for a sandwich lunch. This is a great opportunity to capture some of these interactions and anticipate upcoming shots in an ever changing scene. There is usually only one chance for most of these types of photos before they’re gone forever. Listen as I explain some of the history of the area, including some ghostly stories concerning a window that’s never closed, a bookshop and a rose. See and photograph the £1 million gold plated clock (and all the people photographing it!) and find out who gifted it to the University. Learn what used to lay behind the 70s brutal architecture of Petty Cury and the Grand Arcade. Cambridge City Centre on Friday 31st October - using just street lighting, window overspill and whatever lighting is available - no speed lights or modifiers. Models are queueing up for this shoot and I have 2 photographers confirmed so just need 4 more photographers before pressing the ‘Go’ button! Photographers must have cameras capable of ISO 1600 minimum and lens aperture of f2.8 minimum or wider. The model will be suitably attired and made up in Halloween style, and paid. We will meet at 7pm in central Cambridge and shoot through to about 10.30pm, using a number of different locations and lighting areas in the City Centre. Spaces are obviously limited, so payment of £45 per Photographer will be required before the night either by BACS, cheque or credit card before the night.